And I am back at work. My life style is affecting my baking, but I think that I am back in the groove. I am so intrigued by the bread that the Bread Baking Babes have posted, Black Russian Rye. Take a look at the pictures at My Kitchen in Half Cups. The thought of making bread with old bread and coffee intrigues me. But something has gone wrong with the starter that lives in the back of my refrigerator, complete neglect on the part of the baker I'm afraid. So Paul has posted step by step instructions on how to start your own starter with pineapple juice on his blog, The Yumarama Bread Blog. I just had to give it a try. So his starter is doing its chemical thing on my counter. I made a biga yesterday so I could make the Italian bread today. Very easy bread, the fermenting and rising times never take quite as long in my kitchen. I worry about the AC slowing things down, but it never does. The rolls came out of the oven and made me wish that I could post smells. What an aroma. And then we did the unthinkable. We tore into one of them without waiting the appropriate hour, we didn't even wait ten minutes. This may be my new favorite bread. I have been waiting for this bread. The French Bread at our local market leaves something to be desired. We only have one grocery chain, and bread making is not their strong point. I don't know if it is a regional thing but when we go back East, and out West, we covet the local breads. I love how Reinhart says that this method will allow you to make a full flavored bread in five hours assuming you have the pate fermentee in your refrigerator. How many people have pate fermentee in their frig? I don't think that we can really call this a one day bread, but I am hoping that it will be a I remember on Friday night to make the pate fermentee, easy Saturday bread. and then you add the flour, salt, yeast and water for the bread. I let the mixer knead it for 8 minutes and then let it rise. After an hour, it had already doubled so I degassed it and let it rise again. This is my first shaping of a baguette. I believe that mine were a little more batard at their ends, I definitely will have to refine my technique. And the slicing was a little confusing. I am not sure how deep the slits should have been, I think that I will go deeper on the next try. So, maybe the shape and slits should be adjusted but the taste is delicious!. I made some oven baked tomatoes to slather on them tonight, can't wait! This was a fun bread. I started with the Herb oil. I used rosemary and roasted garlic. I can't wait to try some of the other herb combinations. The bread was easy to make up, very soft and sticky It spent the evening in the refrigerator developing its flavor. Once it was baked, it disappeared so quickly that I didn't get any photos of the finished product. I made this bread a couple weeks ago, because I knew I would be rotating children. Note to self, write it up when you make it. The details have flown from my brain. It was a keeper, but I do want to try Italian Food Forever's recipe. I enjoy trying different versions of the same recipe and think that I would like to find a recipe that didn't involve the nighttime refrigeration. 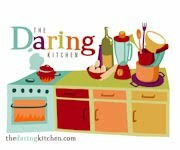 I signed up for the Daring Cooks Challenge. Several of the blogs that I watch are Daring Bakers. I'm not a big fan of pushing myself to new baking extremes. Baking a cake can drives me insane. Starting with folding in egg whites, really, do you fold? Like a towel? Too much and you don't get the lift, too little and your cake will rise funny. Then, cutting off the top of the cake so it is nice and flat seems so wasteful. Anyway, I like to cook more than I like to bake. So I joined. There are all kinds of secretive rules surrounding the challenge, the web site, The Daring Kitchen, lists all the rules. But on the 14th of each month, we can all post our blogs about the challenge. I have to type up the cooking experience before the 14th however, I would forget half of the details. This month's challenge was hosted by Olga from Las Cosas de Olga It is rice with mushrooms, artichokes and cuttlefish. Olga's blog has some beautiful pictures and is written in Spanish. It was great fun to make something clearly different from my usual fare. However some of the ingredients were a little challenging to find here in the middle of Texas. Like cuttlefish, cuttlefish is in the same family as squid so I substituted squid. The recipe called for two cuttlefish, I wish there had been a size or weight associated with the ingredient. I added more squid than two since mine were small, but could easily have added even more. Artichokes were $3.99 a piece at my local grocery store, so I substituted frozen, already cleaned, I thought they were a bargain. The dish involves a sofregit, cooked down onions, tomatoes, garlic, peppers. Which is added to the short rice and fish stock. I made that first and it filled the house with the arouma. The dish is finished with an aioli and Olga lists two ways to make it, the traditional method with only a mortar and pestle and the modern method with a mixer. Next time I will try modern. The 20 minutes of hand grinding was a little much for me. We enjoyed the dish, we felt like we had a little piece of Spain in our kitchen. Emily and I flew to Pittsburgh with Matt to help him move his things from his old condo to his new house. I'm still a little freaked out by the whole trip. I have come to several conclusions. Number one, Delta is short at least one airplane. There are not enough seats on the planes that they have to accommodate their passengers on a given day. The ticketing agents are very skilled with methods of deceit and illusion. "while you were flying in circles around Atlanta, your connecting plane took off" how does that happen? One plane can't land because the weather is so bad, but the other plane can take off? "We are sorry, your plane had mechanical problems, here is a coupon for the airport hotel and a $7 coupon for dinner" Really, mechanical problems, or did the plane never exist. And is there any hotel at a major airport in the US that you can actually purchase dinner for $7? And I eat breakfast. As a nurse, I truly believe that breakfast is the most important meal of the day. As for that nurse thing, when the pilot asks us to keep our seat belts on because the flight is going to deteriorate, my mind comes up with some pretty scary scenarios. In the medical field, the patient's condition "deteriorating" never ends well. Wipe that verb from your pilot vocabulary. Number Two. There are slum lords in Pittsburgh. We are paying a lot of money for Matt's house. More than we would if he was living on campus. You would think that if you were paying that much, the place would at least be clean. The following picture is not for the faint of stomach. This is the sink in the kitchen in Matt's house, before his sister spent an hour cleaning it. Using a potentially toxic combination of cleaning products, she made great improvements. She believes that the previous tenants never cleaned the kitchen. However, on August 3rd the sink was no longer a health hazard. Will it ever get cleaned again? And does Emily win the sister of the century award? Conclusion Three I am getting old, my feet ache, my hands ache. After spending two days painting, cleaning, moving I could barely carry my suitcase all through the airport looking for the nonexistent flight. I made a list in my head of things to do when I got home. Realizing that I was up at four am, my desire to do anything on the list is waning. I want to bake bread in my clean kitchen. I need to get the starter going, but the couch looks very comfortable. The shrimp salad is easy, cool and refreshing. Cook some shrimp. I like Ina Garten's way for Roasting Shrimp, peeled, tossed with olive oil and pepper and into a 400 degree oven for 8 minutes. (If I really want to have delicious shrimp, I brine them, but that is another story.) Let shrimp cool. Make a salad with tomatoes, red onion, cilantro, diced avocados, and a dressing with red wine vinegar, lime juice, olive oil. Add the shrimp and toss. Tomorrow, I may turn the stove on and cook in my kitchen, which is not this kitchen. I may use some of the spices that I picked up at Penzey's on the strip. There is a crisis in the house. Someone ate the last of the English Muffins and it wasn't the oldest member of the household. (For three months of the year, there are three months when my husband is older than me.) He searched all over for them when he was making his breakfast and assumed that there were no more. It turns out that perhaps there were still muffins available but he did not know where they had been hidden. At all times, carbohydrates must be out of the reach of the dog, so I put the muffins in the cupboard above the toaster. Not the usual bread spot. Anyway, the muffins were delicious. Quickly made into muffin and egg sandwiches by the tallest member. Eaten without any preparation by Emily. Enjoyed by all present I think. My boules were lovely and I took great care to not allow them to flatten when I transferred them to the hot pan. Perhaps too much care. They did not flatten when I flipped them so when I moved them into the oven for the baking period I squished them with my spatula. I could not have imagined them fitting in the toaster without intervention. I need to work on their undersides, get the bottom of the boule a little smoother. I'm curious if they last, if you could make a double batch for the week, baked them and put them in the refrigerator. And I need to make my husband happy, so I have another batch fermenting on the counter. A novice blogger, I find myself enticed by the challenges out there. The opportunity to try new things, suggested by the blogging world intrigues me. I recently joined Recipes to Rival and participated in my first challenge. Fried Pickles and Ice Cream came up with a refreshing challenge for Recipes to Rival, Bruschetta and Limoncello. Bruschetta is a delicious Italian appetizer and Limoncello is an after dinner drink. I started working on this challenge weeks ago. First I had to purchase grain alcohol. Some people make their Limoncello with Vodka, but if your state allows its sale, grain alcohol is the alcohol of choice. Here in Texas, I had several varieties to choose from. However, before I could make my purchase, I had to endure the lecture from the perhaps twenty-five year old sales clerk. Grain alcohol is very strong, very dangerous. I told him that I was making Limoncello out of it. He had further warnings about the Limoncello. I added the beautiful lemon zest to the grain alcohol and let it sit in a cupboard for several weeks. Every so often, I would pull it out and shake it. At some point, my young adult sons discovered that I was making Limoncello. When the time came to strain the mixture and add the sugar syrup, taking care that there are no open flames, I was accused of making a home brew. The Limoncello was chilled and we sampled it. I am just not a liquor person. At this point in my life, I have had the opportunity to try several after dinner drinks and they are not for me. However, with a little tequila (2 parts), limoncello (1 part), contreau (1/2 part), lime juice(1 Part), lemon juice (1 part) and simple syrup(1/2 part) this turned into a delicious margarita.